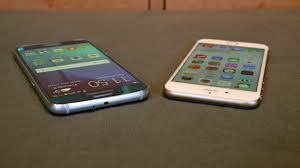 Samsung Galaxy S6 Edge vs Iphone 6 comparison:–The Samsung Galaxy S6 has been announced, and will hit shops on April 10. When it does land, we fully expect a titanic tussle between Samsung’s latest Galaxy instalment and the iPhone 6. In recent years, Samsung has been the only manufacturer capable of offering up a flagship smartphone handset with anything approaching the global popularity of Appleâ€™s iPhone range. The Korean company certainly has a big challenge on its hands after the chaps at Cupertino shipped a whopping 74.5m iPhones in the three months leading up to Christmas last year. 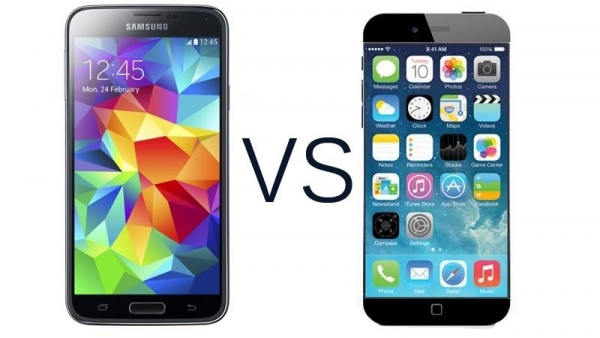 Samsung has gone back to the drawing board with a stylish new design for the S6, which means that this year could see the biggest scrap yet between these two tech titans.Lets have a comparable look below in details Samsung Galaxy S6 Edge vs Iphone 6 comparison,specifications, price, pros and cons. After years of uninspiring plastic designs, Samsung has finally listened in: the new Galaxy S6 edge is made of fine-quality materials and has a truly premium feel. The S6 edge features a sturdy metal frame sandwiched between two pieces of glass on the front and back. Samsung has also added new color options: the S6 edge is available in a choice of black, white, gold, and green. The Apple iPhone 6, on the other hand, features an all-aluminum build with a choice of space grey, silver, and gold. Both the Galaxy S6 edge and iPhone 6 are impressively thin devices: the iPhone 6 is a hair thinner at 6.9mm, while the Galaxy S6 edge measures 7mm in thickness. The difference is barely noticeable, but what is noticeable is that both phones have a protruding camera module resulting in a hump on the back of both devices. The Samsung Galaxy S6 edge features a 5.1-inch Super AMOLED display, larger than the 4.7â€ IPS LCD screen of the iPhone 6. With a resolution of 1440 x 2560 pixels (Quad HD), the screen on the Galaxy S6 edge is extremely crisp and paper-like with a pixel density of the record 577ppi. The iPhone 6, on the other hand, features a more modest resolution of 750 x 1334 pixels, which works out to a pixel density of 326ppi. The Smasung Galaxy S6 Edge boosts up with 8-core, 2000 MHz, ARM Cortex-A57 and ARM Cortex-A53, 64-bit with a 3072Â MB of RAM which is one of the fastest processors out there for mobile devices Â fitted inside intending for an affordable price tag and with respectable performance with the Â Adreno 430 GPU .While the Apple Iphone 6Â features a Dual-core 1.4 GHz Cyclone (ARM v8-based) with aÂ GPU of PowerVR GX6450 (quad-core graphics). When we work on the phones then we found that theHTC M9 takes a lead in terms of processor speedÂ as the Samsung boosts up with the high performance intending octa core processor where the other one uses quad core processor. So the Samsung Galaxy S6 Edge here again let us choose it Â over Apple Iphone 6. With an f/1.9 aperture (front and back), the Galaxy S6 Edge promises to improve the speed and low-light performance of its shots, while a real-time HDR mode should boost image quality further. Meanwhile, the camera app interface has been cleaned up significantly. Apple stuck with an 8-megapixel camera for the iPhone 6, just as it did with the iPhone 5S, the iPhone 5, and the iPhone 4S before it. Of course, much like with its screen resolution and CPU set-up, Apple does things its own way when it comes to camera tech. And just like with those aforementioned components, itâ€™s tough to argue that Appleâ€™s way doesnâ€™t work beautifully. The iPhone 6 takes some of the best photos of any smartphone, and it does so quickly and reliably. Galaxy S6 Edge looks to be even better. Apple has been the smartphone camera king for some time now, but Samsung looks set to provide some major competition. Samsung’s Galaxy S6 Edge has by far the bigger battery in this comparison, with a 2550mAh cell against Apple’s 1810mAh. While the iPhone could last a day with careful use, the Note 4 will last a day and then some. Both phones are fast to charge, but the S6 faster, able to reach 50 percent in 30 minutes. Meanwhile, Apple’s iPhone 6 gets to 50 percent in one hour. The S6 Edge battery is removable, too, which will appeal to many users (we prefer to use a power bank). Samsung also offers an Ultra Power Saving mode, which longs out the last little bit of juice by switching off screen colors and inessential features. Samsung has caused a bit of a stir by dropping micro SD support with the Galaxy S6 Edge – the first of its flagship range to do so. It’s clearly emulating Apple’s approach here, which is all about providing a more streamlined and speedy approach to storage. Samsung still wins this round despite that omission, simply by virtue of the fact that it has dropped the 16GB allotment and adopted 32GB as its starter specification, while Apple has done the opposite. Samsung takes back that lead in connectivity. Apple has finally added NFC to its phones, but only for Apple Pay, which right now isn’t of any use in the UK. . Both are 4G phones, with the iPhone 6 supporting more bands for roaming but the Note 4 theoretically faster with Cat 6 (up to 300Mb/s) rather than Cat 4 (up to 150Mb/s) 4G. The pair also support 802.11ac Wi-Fi (2×2 MIMO for Samsung), Bluetooth 4.0 (4.1 for the Note 4) and GPS. The Note 4 adds MHL, an IR blaster and Samsung’s Download Booster, which combines the power of 4G and Wi-Fi for faster downloads. Samsung Galaxy S6 Edge or the iPhone 6 Â We obviously can’t say anything yet, but from what we’ve seen of the Iphone 6, we could have one of the biggest threats to an incumbent Samsung Galaxy S6 Edge yet. The truth is that that Samsung Galaxy S series and the iPhone series haven’t had all that much in common in recent years, but now Apple appears to be targeting the one area Samusung has always dominated: design. With a metal chassis and divisive touches like the lack of microSD support and waterproofing, not to mention a non-removable battery, the iPhone 6 Â design is closer to the than it’s Samsung Galaxy S6 Edge been since the days of the iPhone 3GS. As per price, the Samsung Galaxy S6 Â Edge is available at Rs 49,900Â INR (priced too high)and the Apple Iphone 6Â available in India at a price tag of 54,000 INR.